Water, water, everywhere! To worship the wettest Wednesday we’ve seen in New York, I decided to whip up this watery dish for the weekend. [Signal applause for alliteration.] In all seriousness, though, we had one whale of a washout! The storm woke me up at about 6am early Wednesday morning, and it continued to gush through my screen windows. Had I slept with the air conditioner on like most people, I wouldn’t have gotten water all over my wood floors, but alas. And that thunder! A couple of hours later, the day was all but serene and unusually hot and humid for such an early hour. I took a shower that morning and never dried. Then I was without transportation for a couple of hours, which would have been great had I known the subways weren’t working due to flooding before walking to two additional stations in vain. Misled to believe that there was one working train at Atlantic/Pacific Avenue in Brooklyn, I got there and it was Summer Jam 2007 in the streets: stranded commuters, squawking into cellphones, all pushing around and trying to get into lines for full, steamy buses. Not my scene. Anyway, now that’s all in the past. My intention with this dish was to use water for the better of mankind, rather than the heinous. It pairs calamari, cooked only with water by steaming, with water spinach, a lovely green that I scored from a produce stand in Chinatown. Water spinach grows in water for the duration of its life before it is cut. Calamari (aka squid), obviously, swims in the sea before being caught. They both share a very mild flavor profile, which seemed to me perfect for tossing in a cool, summer salad. The Chinese absolutely love water spinach — I cannot even count the ways. Called “hollow heart vegetable” in Chinese for its crisp, hollow stems, it tastes like virtually nothing, like water. Yet it’s the epitome of the luxe, tender leafy green. The lady at the produce stand nodded approvingly when I picked up a bunch, pointing to them and saying, “Very good!” They grow in warm climates and are shipped here from California only in the summer, so they won’t be around for that much longer. The elastic, yet easily breakable texture of the leaves also contrasts with the clean, brittle crunch of the plant’s stems in a way that is deemed infinitely satisfying. When separating the two parts, the leaves heed to your slightest pull, making a pleasant “snap” noise as they break from the stem. Tearing a pile of long, stemless leaves clumped up together feels like you’re pulling apart a single strand of cornsilk. Don’t ask me how or why, it just does. The mouthfeel of the stems is similar to watercress’, only magnified ten or so times since these hollow tubes are bigger and full of water. Put simply, the leaf and stem are delightfully yin and yang. So with water spinach on hand, I sliced up some rings of fresh calamari and seasoned them with a pinch of five spice powder before steaming. 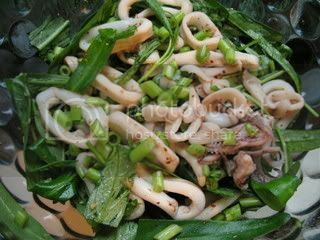 (It seemed like I should use a little bit of flavor at least, but not so much that you wouldn’t be able to taste the faint squid and water spinach themselves.) The dressing was made up of a little acidity — lemon juice, since all seafood needs fresh lemon juice — and fat. With a little minced garlic and a sprinkle of red pepper flakes to just pump it up some. Steamed squid isn’t for everyone, I know, so if perhaps you want to deep fry it instead, I wouldn’t think that would be a bad move. But then, this wasn’t my oil-themed dish. In a small bowl, marinate the calamari with the five spice powder as you wash, chop and arrange everything else. 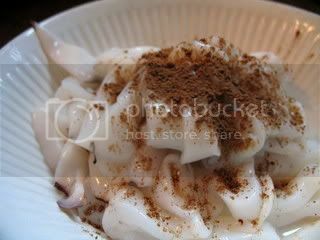 In a steamer or improvised steamer (a bowl on top of a small plate or other bowl in a large pot with 1/2″ water on the bottom on the stovetop), steam the calamari for about 2 minutes, or until just cooked. (Overcooking will make the calamari rubbery and less desirable — take peeks if you must.) Remove from heat, drain any liquid and let cool a few minutes. Combine the lemon juice, garlic, sugar, and mayonnaise in a large bowl. Add sesame oil and stir rapidly until emusified. Fold in the spinach leaves and stems and toss to coat evenly. Add the calamari and red pepper flakes and give it a final toss. Serve immediately. Four brownie points: If squid weren’t a protein that happens to be relatively high in cholesterol, this recipe would be golden. 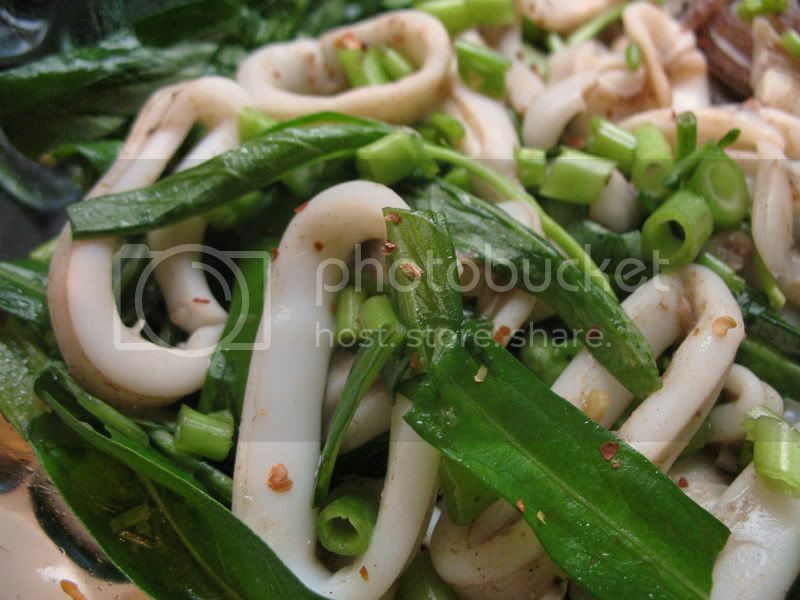 But even so, squid shares with seafood those balancing fatty acids omega-3 and omega-6. Water spinach is a real treat, as it contains many of the leafy-green vitamins found in the dense common spinach like Vitamins A, C and Iron — without giving you that grainy feeling on your teeth. wow, that’s quite an unraveling of water spinach, I really want to try some. do they have a special place in your heart, is that why you can be so descriptive? So you don’t eat the stems? I’ll have to look for it at the Asian groceries here. They always have the best green produce anyway. Hi Kitt: Actually I do eat the stems, but chop ’em up nice and small separately from the leaves. They’re great! Iang: Thanks! I guess I was just in a descriptive mood, since I have little history with the vegetable. I love that you know so many unusual greens. Whenever I ask my mom what she’s cooking, she tells me they’re “Chinese vegetables.” Maybe you could do a little tutorial on the ones you know? Isn’t that infuriating, Aoife?? I hate that all-encompassing “Chinese vegetables” label. I may have just a tutorial like you describe coming up in a bit… will keep posted! I’m not sure where to find water spinach, but I sure am going to look! I love calamari and this sounds like a nice change from fried calamari. It might interest you to know that this is called water convulvulus – and in tropical countries like mine, they grow prolifically in the drains and ditches with stagnant water. 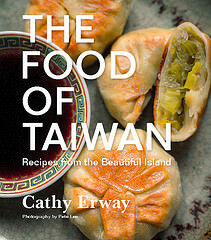 We love it stir-fried in a spicy chilly-shrimp paste sauce – one of my faves! 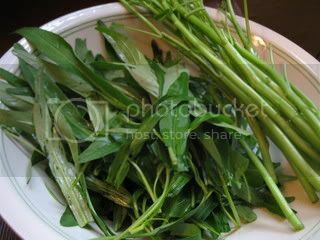 I never knew the veg I grew up loving on the dinner table was often called water spinach until now… I saw the picture and recognized it right away. The simplest way of cooking this was stir fried with a small amount of oil, some salt, and chopped garlic. Even I can’t screw that up too much. Sorry for being off topic, but I am just starting my website/blog. Why did you choose WordPress over blogger or any other blog program? I am trying to figure out the very best way, since I’m not a techy.